Words of wisdom and inspiration from those who have mastered the game of Australian Rules football have been collated and beautifully presented in The Search for Perfection. The book provides an inside view into the inner sanctum of the AFL and into the hearts and minds of those who have made this great game what it is today. The Search for Perfection is the perfect book for AFL fans who understand the need to stay strong in the face of adversity and never give up until the final siren. 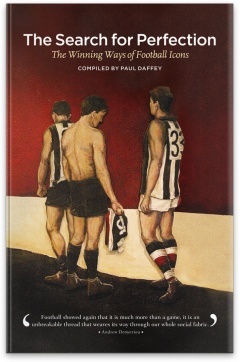 Featuring quotes from Bob Davis, Nathan Buckley, Adam Goodes, Ron Barassi, Jock McHale and many more. Read a review from Punt Road End.